Gene expression is the process whereby the information in a gene produces the final gene product – a protein. Gene expression refers to genes being turned “on’” or “off” – that is, stimulated to produce protein. Healthy development of all organs in the body depends on which and when certain genes are expressed. You can think of genes acting as an orchestra, turning on and off, and producing proteins that act together – in concert-like fashion – in the development of an individual. 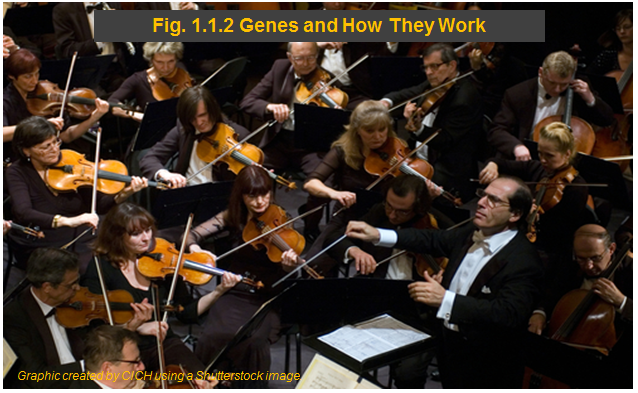 Many factors can influence the individual instruments (genes) in this complex orchestra. Genes provide the directions for building every molecule the human body requires. There are hundreds of different kinds of cells in the body, and it is the variety in gene function and expression that determines these differences.